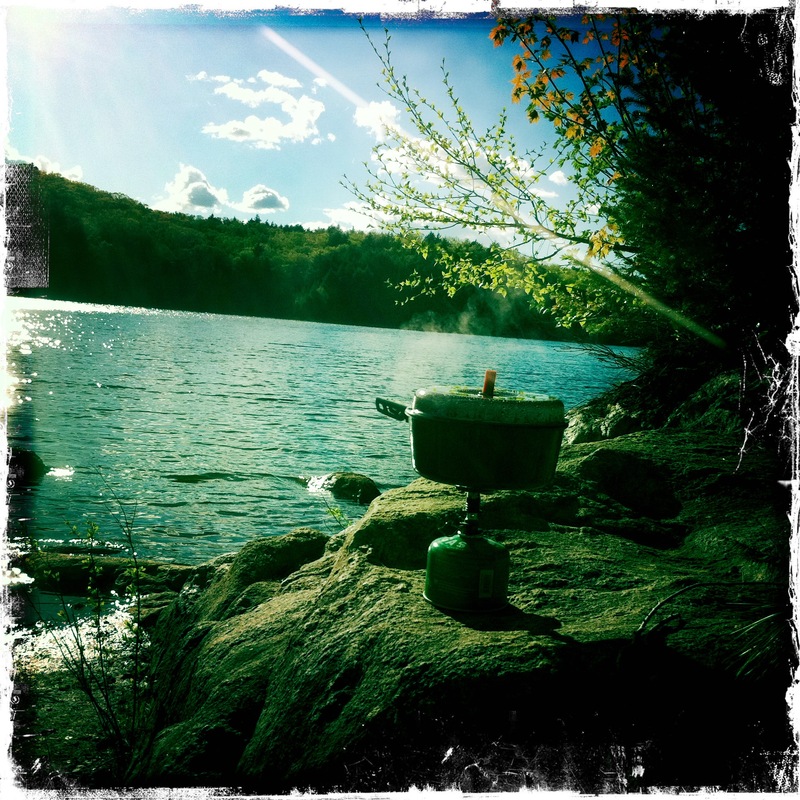 In the seven months since our last visit to Algonquin, we’ve been planning the canoe trip that was to have happened in the fall. After getting our asses kicked on the Highland Backpacking Trail, we had a real appreciation for how big and challenging the park could be. 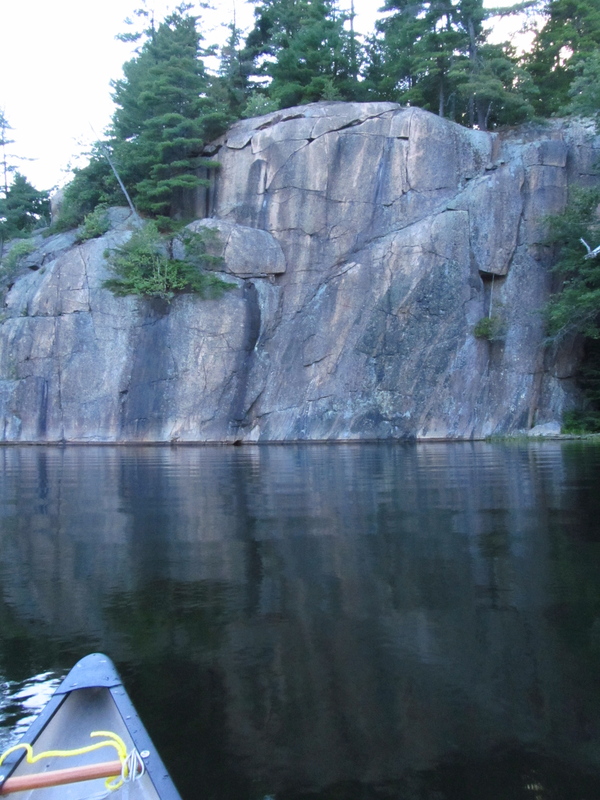 We decided to go for an easy, straight-forward canoe trip with very little portaging and we wanted to hang out at one campsite for our entire stay. We spent months looking at the map and planning various routes. It’s a guilty pleasure of mine to read trip reports by fellow paddling enthusiasts and get ideas from them about routes, food, techniques etc. Unfortunately, our schedules only allowed for Jill and I to be able to get away over the May 24th long weekend. Everything that I had read screamed “stay away!” at this time of year, but if we didn’t take this opportunity, we’d be out of luck until the late fall. 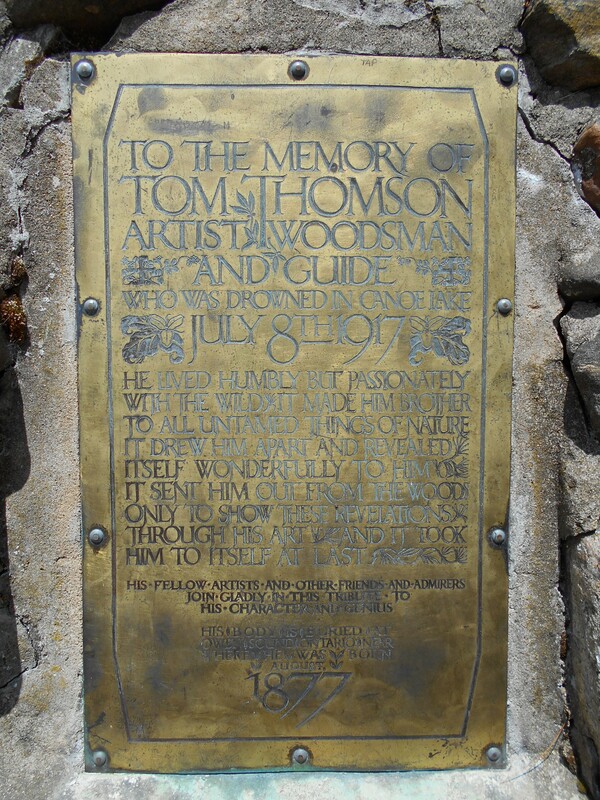 So, we planned ahead, and decided to brave the tourists, black flies and rain. After our last trip, I wanted to invest in some better gear and spent the weeks leading up to the trip acquiring some new necessities (Black Diamond Vista tent, compression bags, dry bags, stuff sacks, map cover… it really adds up!). On the way up to the park, we stopped at the new MEC in Barrie where I convinced Jill to ditch her Coleman sleeping bag and go with the Drake 0 degree down-filled bag (I was the one who was going to be carrying it on the portage after all). 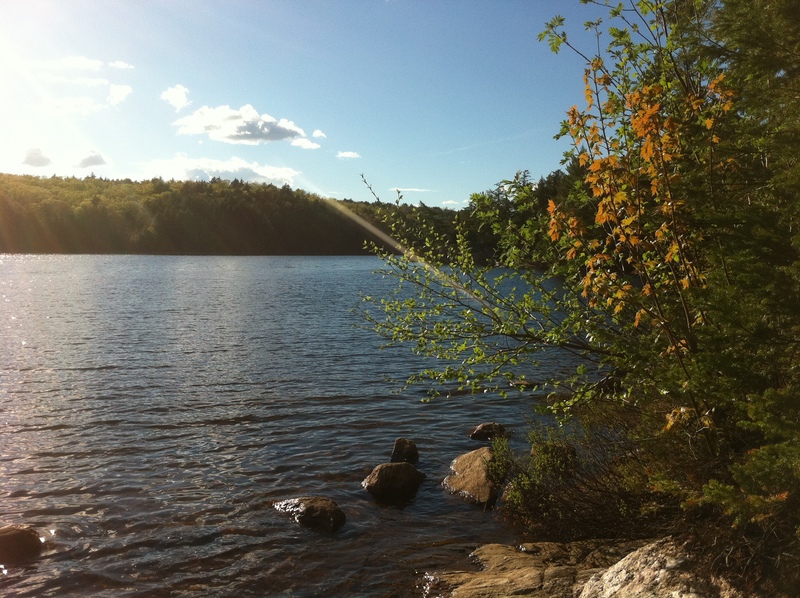 We arrived at the park late on Wednesday (6:45 pm) and decided to just check out the Smoke Lake and Canoe Lake access points and chat with the girls at the permit office to make sure that we were OK to camp without reservations. The park was pretty quiet and they assured us that we’d have no problem getting out early and getting a site before the weekend rush. We debated car camping for the night, but the weather was pretty terrible. We found a great roadside motel in Dwight called the Dwight Village Motel (which we highly recommend! ), went for beer and wings at the Cookhouse Saloon (also recommended) before living on trail mix and couscous for the next few days. I woke up at 7:00 am to light, but steady, rain. We waited out the rain until 11:00 am and went to get our permit and rent the canoe. The Canoe Lake access was pretty busy with paddlers, but not too crazy. Unsure of when we wanted to leave the park, we got a 4-day permit ($70 for 2 people) through to Sunday and rented the canoe for the same amount of time ($180 with life jackets and paddles). 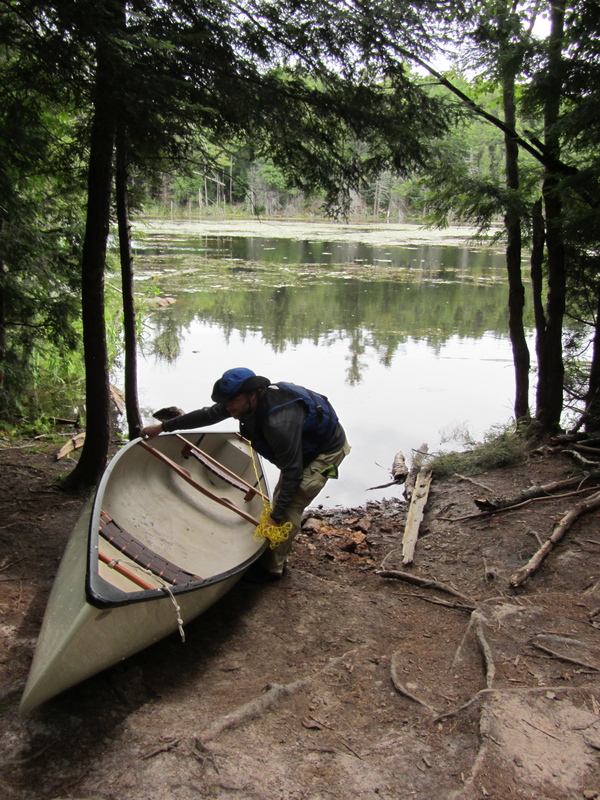 We opted for Smoke Lake – Ragged Lake to avoid the obvious traffic that would consume Canoe Lake in a day or two. We were carrying a lot this time, but since we were “canoe camping” with only one short portage, there were a few luxury items aboard. Lesson #1: Don’t get cocky. 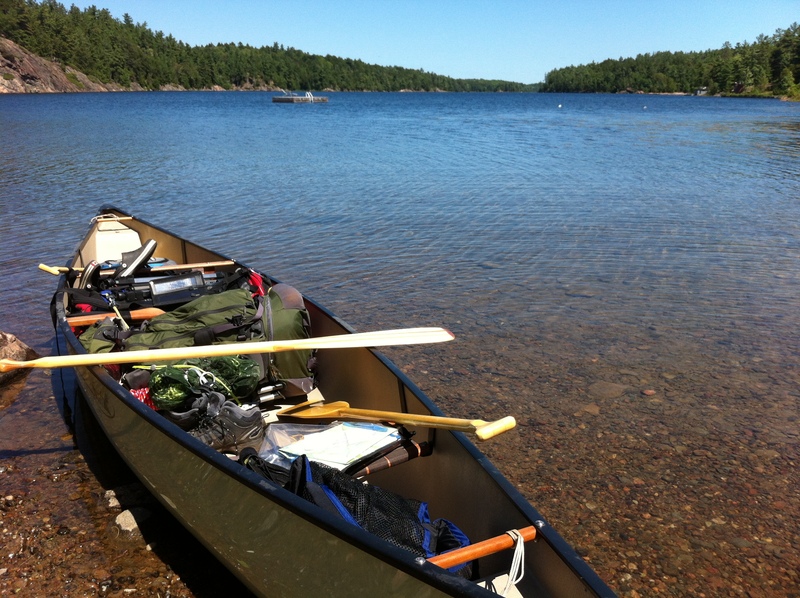 When deciding on which canoe to rent I went with the 15′ Kevlar standard which was about $38/day. The difference between that and the Ultralite was about 10 pounds and $8. Plus, the rental guy told me that the 15′ was more sturdy than the Ultralite. 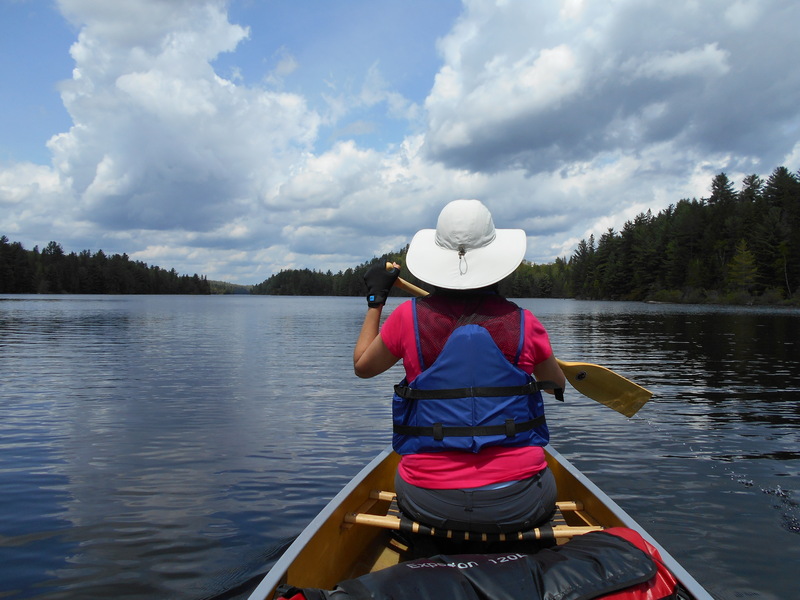 I’ve been canoeing for years, but Jill hadn’t been in one since she was a kid. 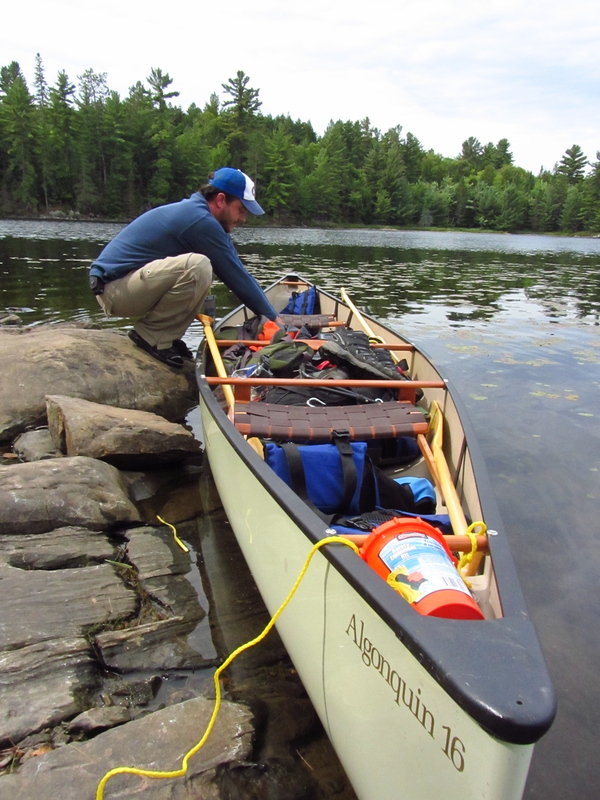 Portaging 10 extra pounds didn’t sound like so much at the time, so I went with stability on the water over comfort on the portage for our first open water experience together with all of our new gear. I was ready to rent the roof rack when the rental guy told me that most people just do the 300m portage across the highway. Why not? Considering that the portage from Smoke Lake to Ragged Lake was less than that (290m), why not do it and see what it feels like, eh? Lesson #2: Portaging is hell on the shoulders. 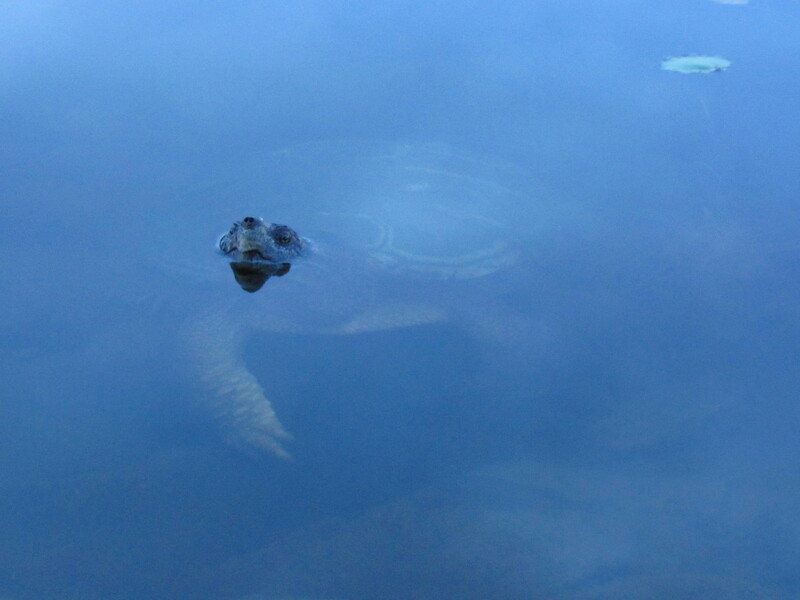 We were a bit nervous when we saw a large group of teenagers hanging out on the dock on the Smoke Lake access. As it turns out, they were a highschool group from Brighton who had just come in from a 4-night stay in the park. Great to see a class dedicated to outdoor sports! They had a great time and caught their own trout. We finally pushed off around 12:30 and made our way down the west side of Smoke Lake, getting disoriented once before getting to the portage. Seems we passed Molly Island without noticing and I misread which bay we were in. It wasn’t until our return up the east side that we saw the narrow between the island and the mainland. 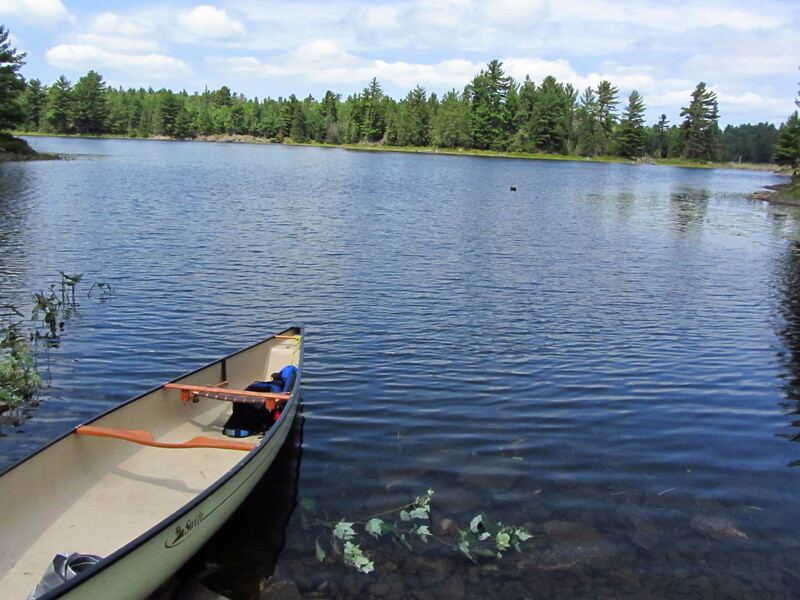 There were a few motorboats on Smoke Lake but only one canoe coming out of the portage. A couple who had spent 2 nights out and warned that the portage was buggy and muddy. Fantastic. Bugs are slow torture for Jill. As soon as we landed at the portage the clouds opened up and dumped a deluge of humid rain on us. It was muddy and buggy as reported. 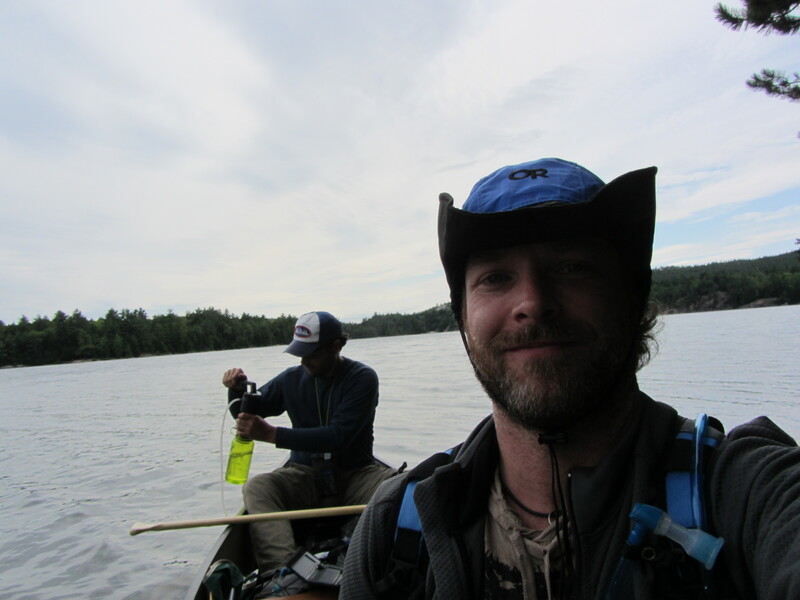 It was around this time that I remembered the rental guy telling me how steep and uneven the portage could be. Sure, it’s short, but it’s no escalator ride. Jill tripped once, falling in the mud with a heavy pack on her back. 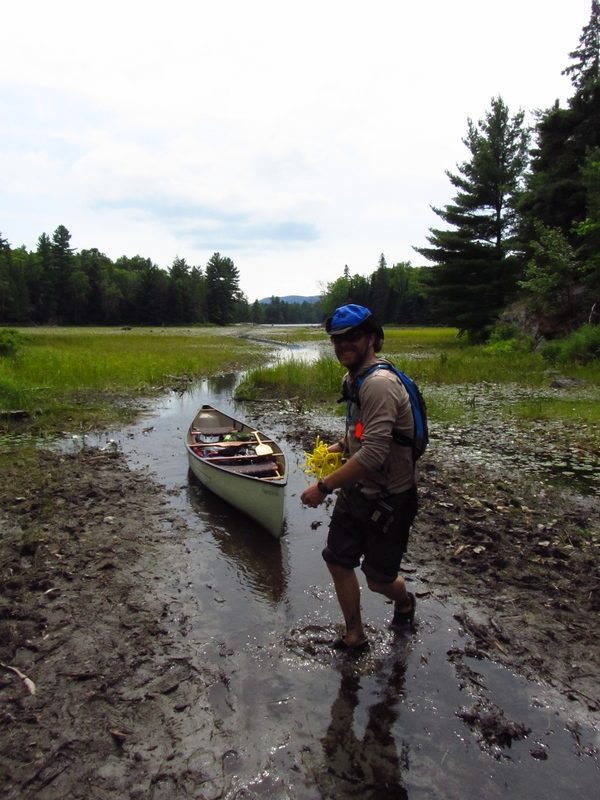 I, foolishly, was carrying the canoe and the 120-litre expedition bag on my back. Upon reaching the other end, we waited out the rain with a tetra-pack of wine. Once the rain stopped, the bugs and flies came out and chased us out of the dam/portage and into Ragged Lake. 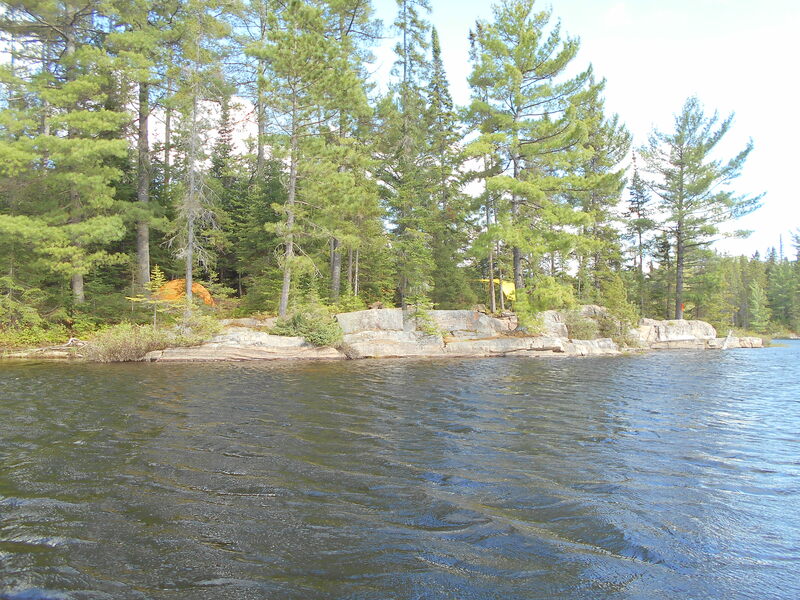 We took a quick peek at the campsite just by the portage and saw that it was haven for flies and wasn’t the kind of site that you’d stay any length of time at. 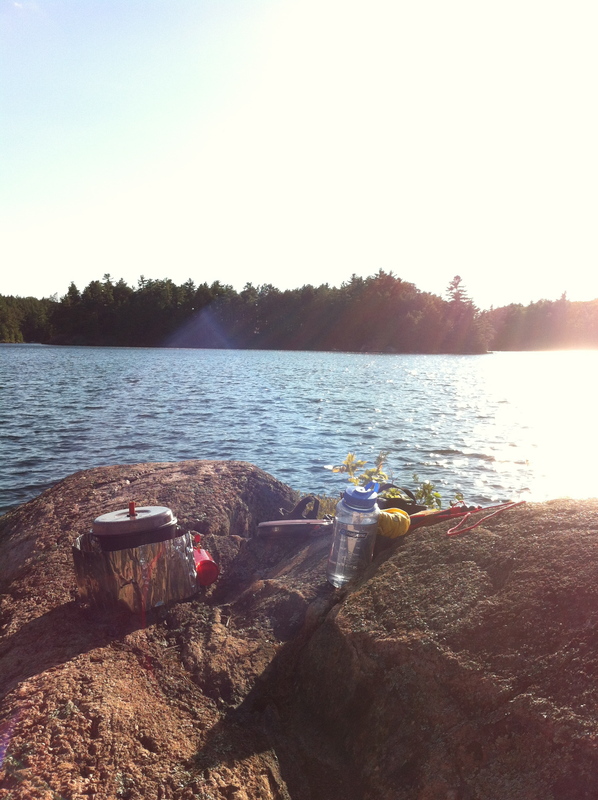 We chose a site on the east side, just across from the tiny island that you *can’t* camp on. It was a beautiful site with a great fire pit. This site would be ideal for a group of 4, but we had it to ourselves. We pitched the tent right away and got our new down-filled bags in there to stay bone-dry. 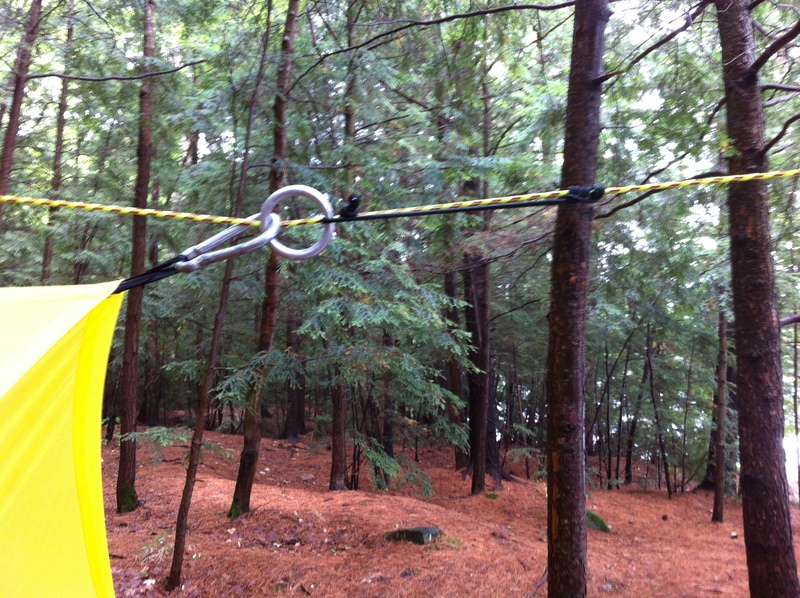 The site had lots of dry wood available and nice options for hanging your bear bags far away from your tent. We didn’t have time to cook anything warm since the clouds were telling us that they had more in store for us. The rain came and we napped, thankful for the rest, and curious to see if our new tent was indeed waterproof. Lesson #3: When buying a new tent, do yourself a favour and buy the footprint as well. We didn’t buy the footprint. In the gear buying mayhem that carried on in the weeks previous to the trip, I managed to forget the footprint. I had even written myself a note to buy it at the Barrie MEC on the last day, but forgot the note in the car while in the store. 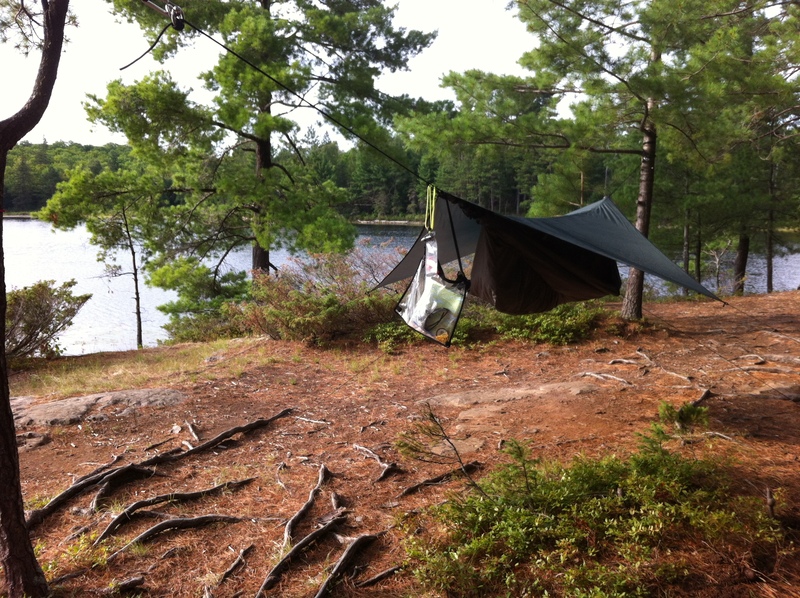 We did, however, buy a used tarp for $10 at the canoe rental store in the park. We used this as our groundsheet and quickly learned that having the tarp so far out as to funnel rain under your tent was a bad thing. The tent, thankfully, is waterproof. And, our luxury items, self-inflating sleeping pads, provide great insulation in the damp and cold. The down sleeping bags work like a charm. There was a break in the rain and we were able to get out for an evening paddle to check out our immediate surroundings. It was beautiful yet brief. We got ourselves into the tent for the night and it rained off and on until morning. The sounds that night were really wild. Mostly loons, bullfrogs and crickets, but an enormous orchestra to be sure. Jill felt something thudding by the tent in the wee hours and there were some tracks. Couldn’t tell if it was a deer or a young moose, but the prints were definitely not bear or anything large. It was a night full of nature on Ragged Lake and we had it all to ourselves. The only other people that we saw on the lake were one canoe with three teenage boys who were only out for the day to fish. They passed our site after 7:00pm saying that they were trying to get back to the rental store. My guess is they camped at the site by the portage that night. We don’t fish and we’re just learning how a day passes in the backcountry, so we spent the first half of the day just tending to our camp. 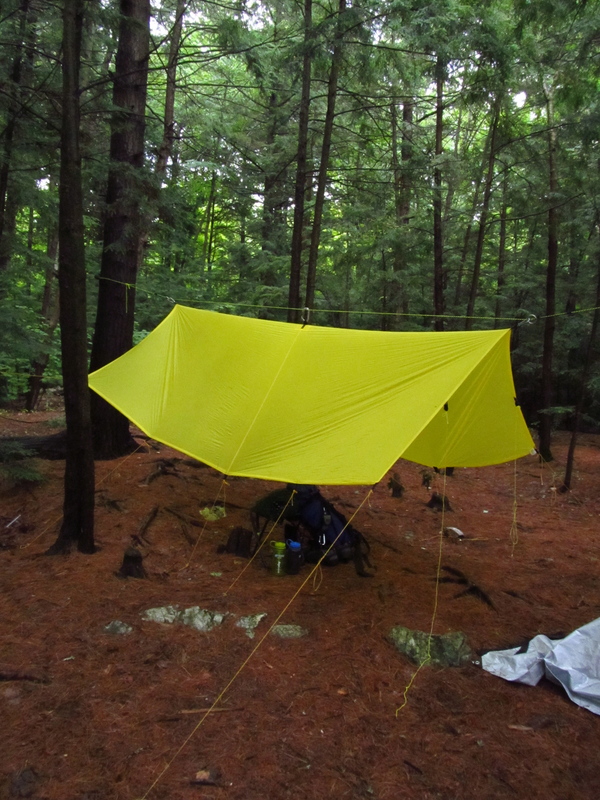 Drying out the tent, figuring out how to rig a tarp, building a smoky fire to keep the flies at bay, etc. 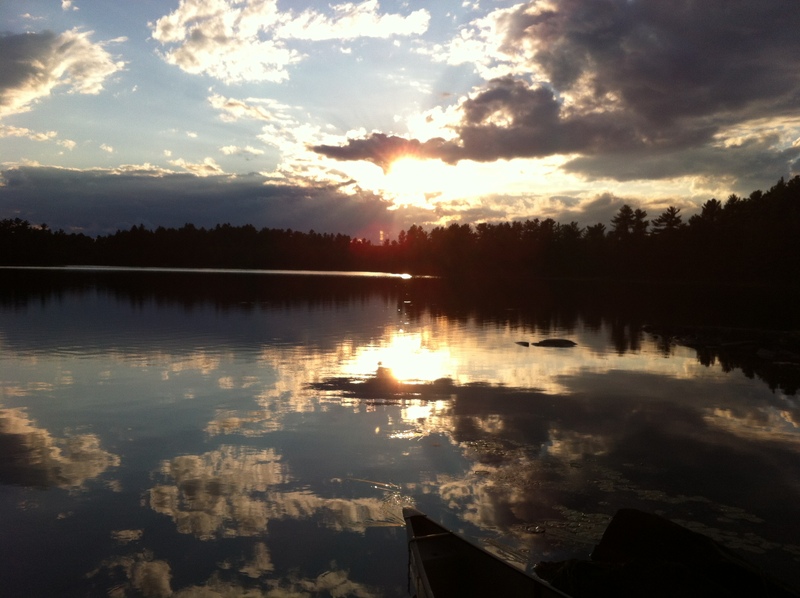 In the afternoon we went out and paddled around the big island in Ragged Lake to check out its 5 campsites. There were one or two that seemed worth looking at, (and they would all suffice if there weren’t any other options), but our trip convinced us that we had found the best site in the area. There are a few other sites that seem well-maintained with nice views, but ours was on a point allowing for all-day sun, nice shade, two swimming spots, and a large clearing with a great fire-pit built up against a large boulder. A good amount of benches for sitting and spreading out gear. And, most important, it’s flat. 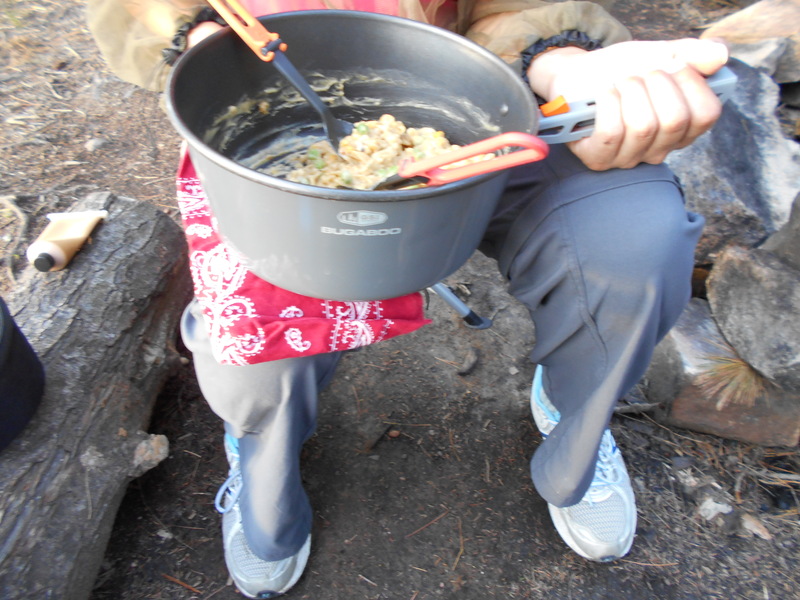 Lesson #4: Bring more food than you’ll need to eat… but don’t bring a one-month supply for 2 nights. There was so much planning and work to do ahead of time, I made real rough estimates of how much we would need of everything food-wise. I bought a new cookset (GSI Dualist) and used the cups in the set as measurement for the dry goods like; flour, israeli couscous, smarties. I used the cups without noticing that they actually have measurement lines right in the cup. My portions were, let’s say, generous. 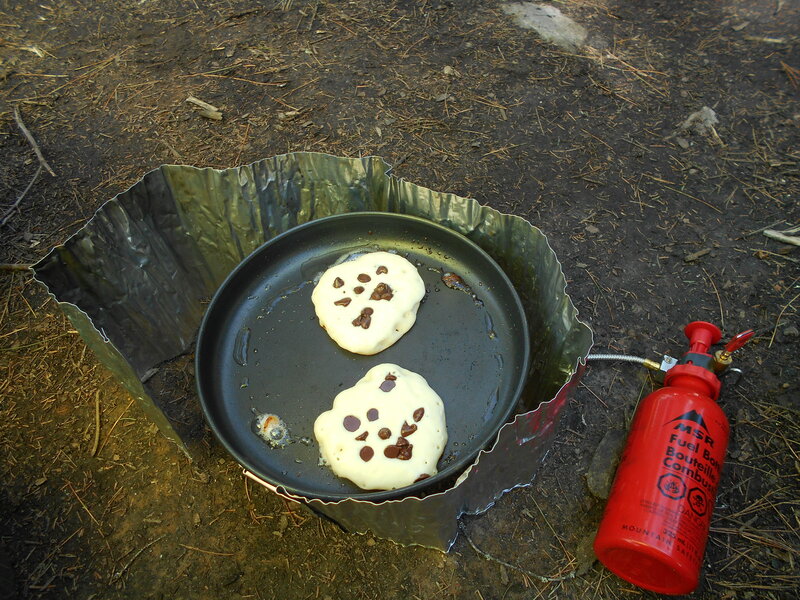 Lesson #5: When cooking a meal in the bush, make only as much as you can eat. It wasn’t until we saw the last five mouthfuls of spicy Israeli couscous with cheese sauce sitting at the bottom of our pot taunting us that we asked ourselves, “what are we going to do with this?” It also took me this long to realize that I had packed enough food in Jill’s pack should the Rapture actually happen this weekend. We were stuffed and we didn’t want to add this to our garbage so early. Lesson learned. Pack light. Eat up. Stay clean. 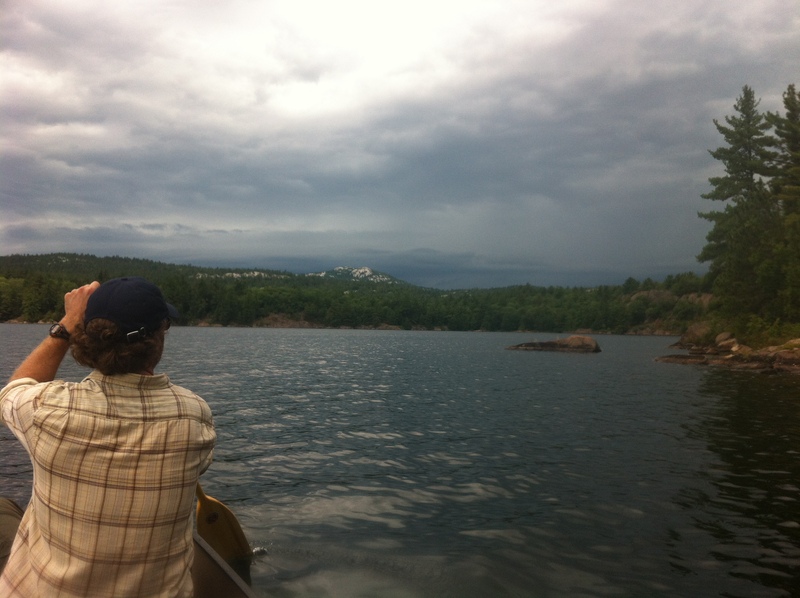 As a “gateway” campsite, we saw a few canoes come by in the afternoon and early evening, some going to Big Porcupine and others to Parkside Bay. 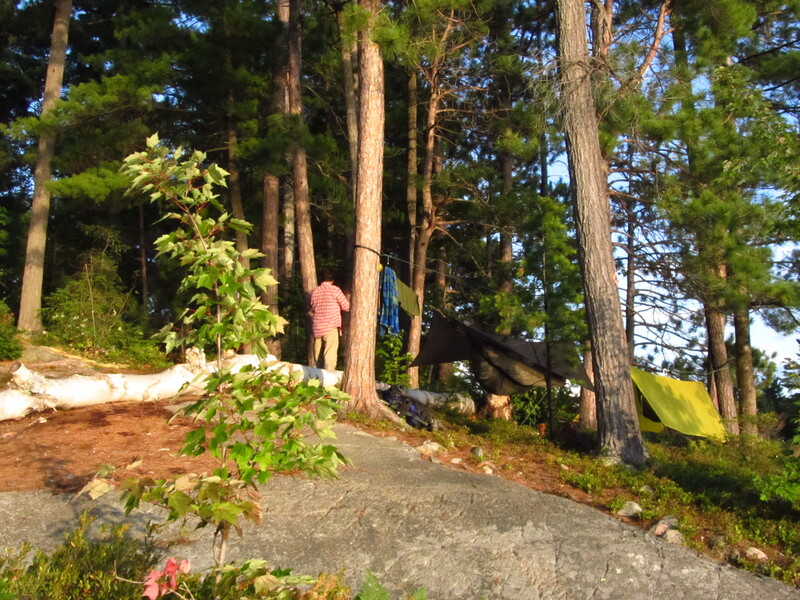 A group of four guys camped at the site across the water on the west side, south of the portage into Wisp Lake. Another soloist was at the site down the way on the south side and the site to the east of us towards Archer Bay had a tent and a fire going as well. It was quiet and the night sky was clear. The temperature was 20 degrees in the day and not much below 10 at night. 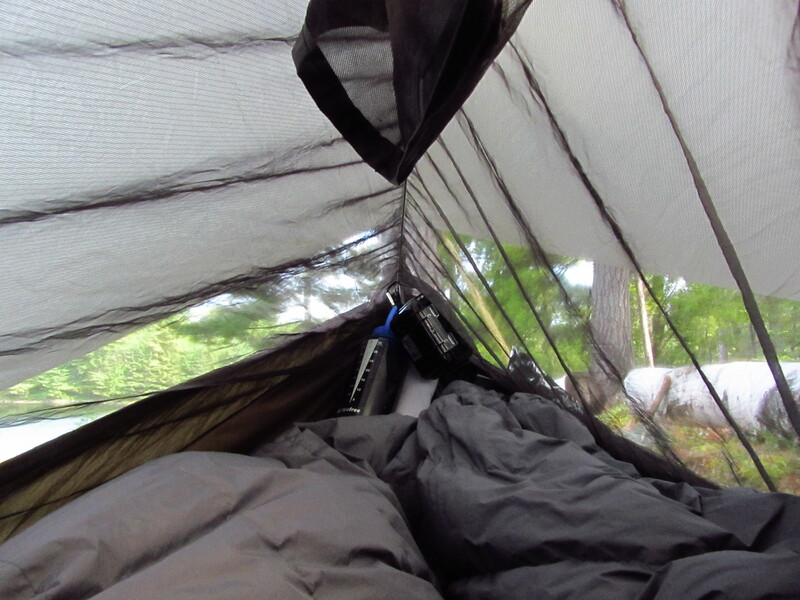 The down sleeping bags were great and the Black Diamond Vista has great air circulation for the mixed weather that you get in Algonquin. Again, we slept off and on throughout the night, being woken by loons and bullfrogs at random times. The campers were quiet. Our permit was good until Sunday, but we could see the traffic starting to come our way. We were already of the mind to leave the park wanting more and the black fly bites were distracting us from the many beautiful moments that pass while living in the woods. There was a Dad with two kids in a canoe floating by checking out sites when I offered ours up to him before the crowds came. He thankfully took it and said that there was another canoe with three more kids and their Dad in their party. We were thankful to be able to pass the site onto a group who could use it well over the remainder of the long weekend. 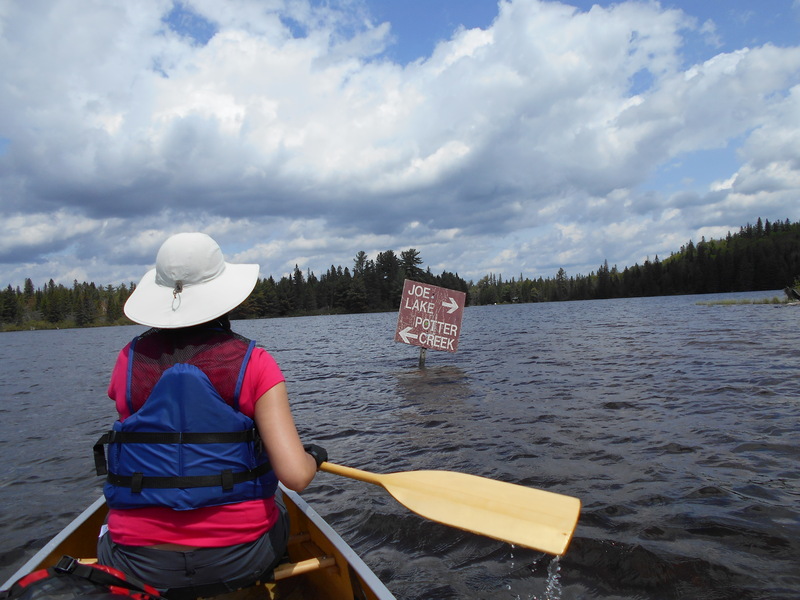 They told us that the portage into Smoke Lake was pretty busy. That proved to be an understatement. Lesson #5: They don’t lie when they say that Algonquin is busy on the long weekend. 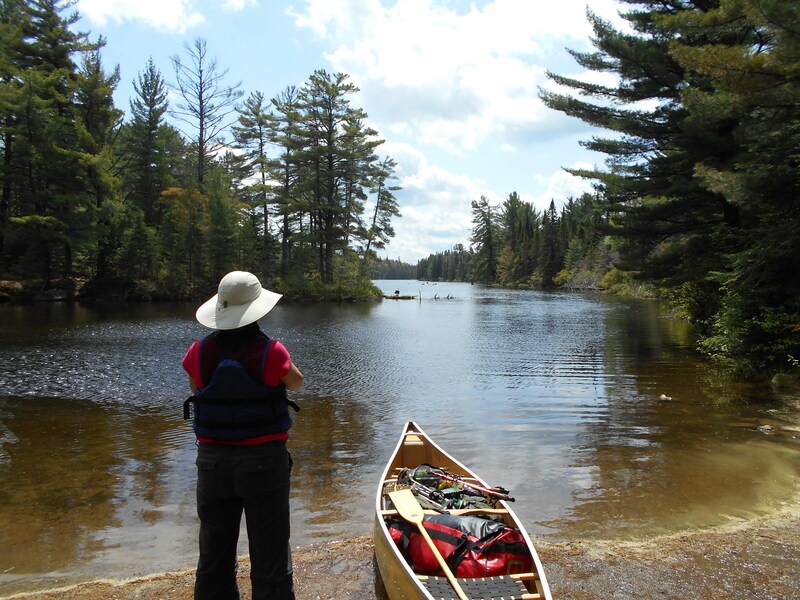 Our campsite was only a 15 – 20 minute paddle from the portage, but in the time that it took us to get to the portage, we passed at least 6 to 8 canoes with varying loads heading into Ragged Lake. 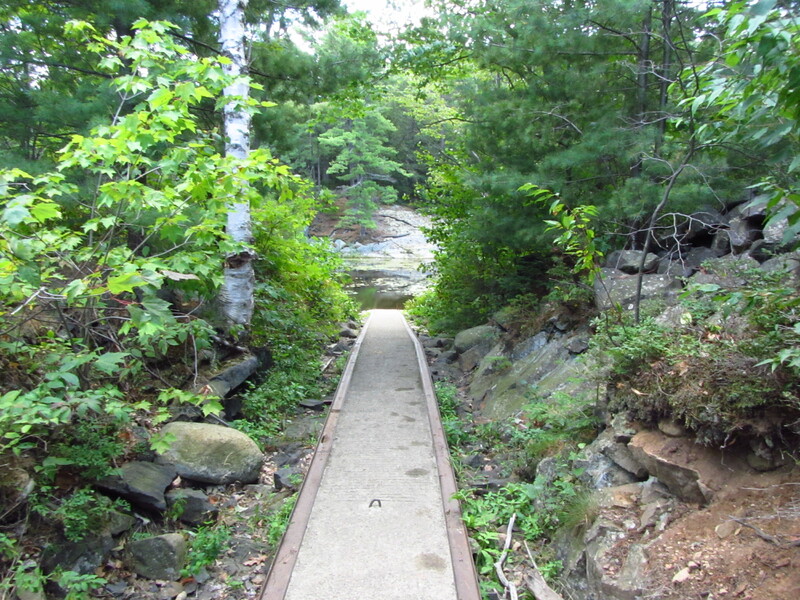 At the portage, there were 2 canoes pushing off and two more coming down the trail. 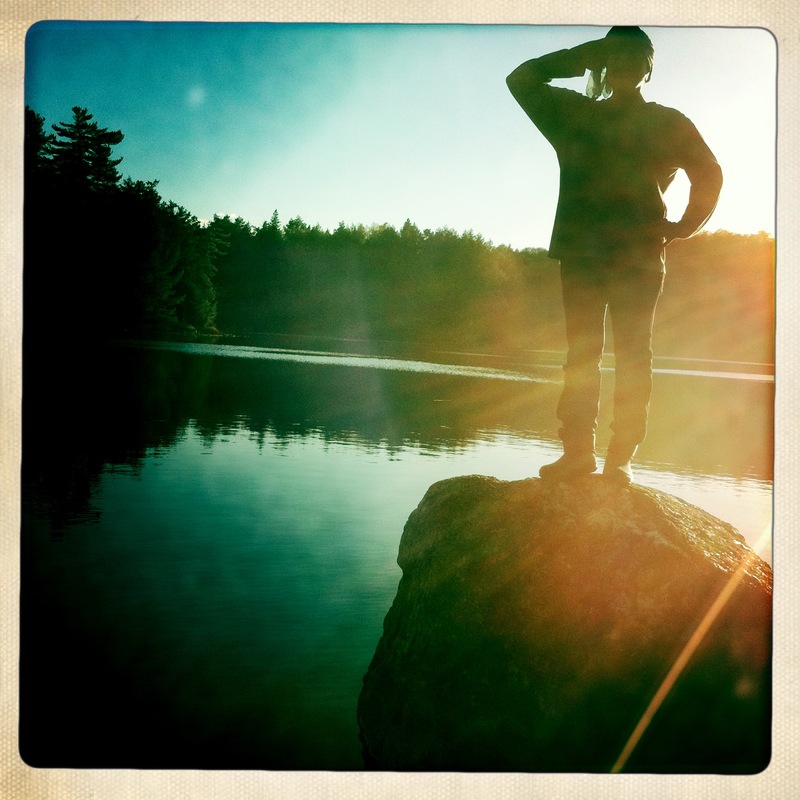 I left Jill with the packs at the dam while I carried the canoe, and only the canoe, to Smoke Lake. On the way, I passed almost a dozen people in various groups carrying some of the most ridiculous things. One guy was carrying a case of wine. I hope it wasn’t full of glass bottles, but it was clearly his job to carry a cardboard box full of liquor. There was a girl coming up the portage carrying an armload of beach gear, pinching a bag of Doritos in her free hand. 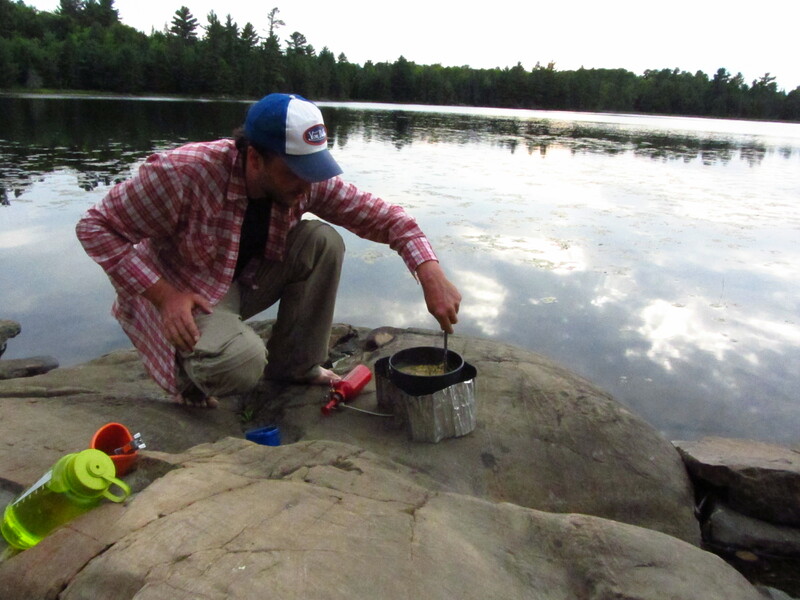 At the bottom of the Smoke Lake side, I felt sorry for the 12-year old kid holding the other end of the 75-litre Coleman cooler that his old man put the hotdogs and beer in. There was a guy sitting at the bank of Smoke Lake having a smoke and finishing off a tallboy of Coors Light. I asked him how he was doing and he told me that his back was “f****d”. Apparently his canoe kept going to the right no matter how hard he paddled on the left and he’d zig-zagged all the way here from the access point. I couldn’t tell if he was joking and I thought it best not to laugh. On my way back to get Jill, I passed the guy who carried the box of liquor for his party. Turns out, they wanted him to carry their bags, too. Mr. Zig-Zag and his party carried in a 13-pound Broadstreet 6-person tent. 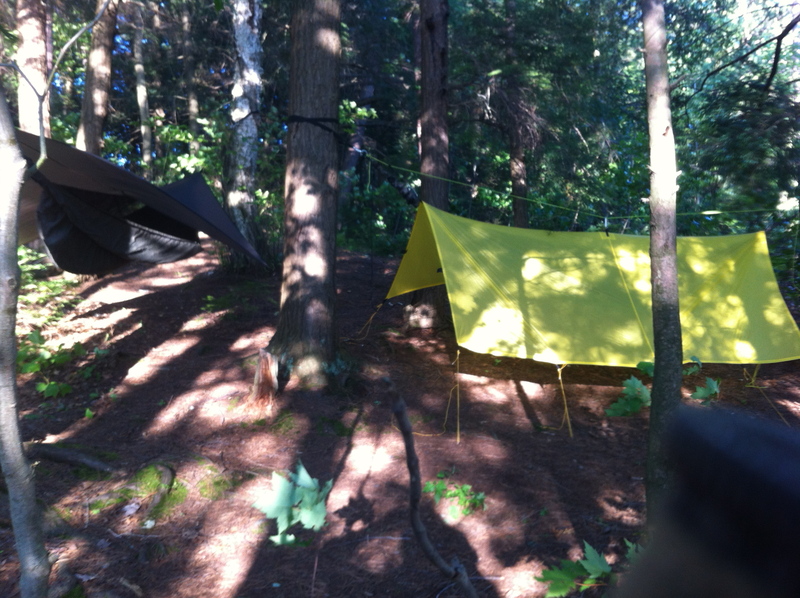 Lesson #6: Camping “ultralite” takes time and practice. Lesson #7: Bring a hat. No matter what. Bring a hat. I didn’t bring a hat. I have lots of hats. Different hats for different occasions. I have hats for camping and canoeing. I didn’t bring either of them. Why? In a last ditch effort to go “ultralite” (save, of course; 2 self-inflating sleeping pads, 3-person tent, 1-month food supply, cribbage board, 2 decks of cards, 2 books, flashlights galore…), I chose to ditch the hat. Again, you ask, “why?”. Because…. I believed that what the weatherman said on Tuesday night would stay true on Saturday. 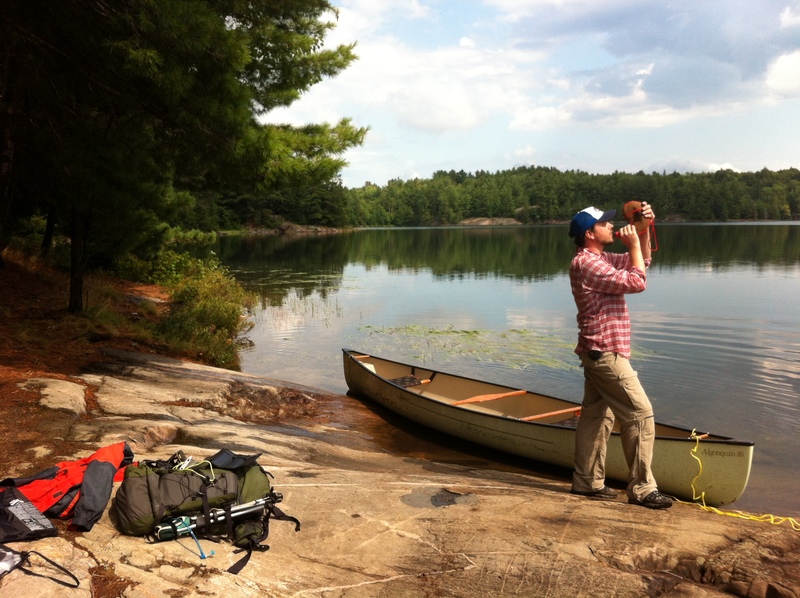 Lesson #8: Pack for rain and shine in Algonquin. It’ll all happen. Probably within the hour. The paddle back to the Smoke Lake access point from the portage was great. We got totally sunburned and it couldn’t have been more beautiful. We passed at least another 6 to 8 canoes that were heading towards the portage. 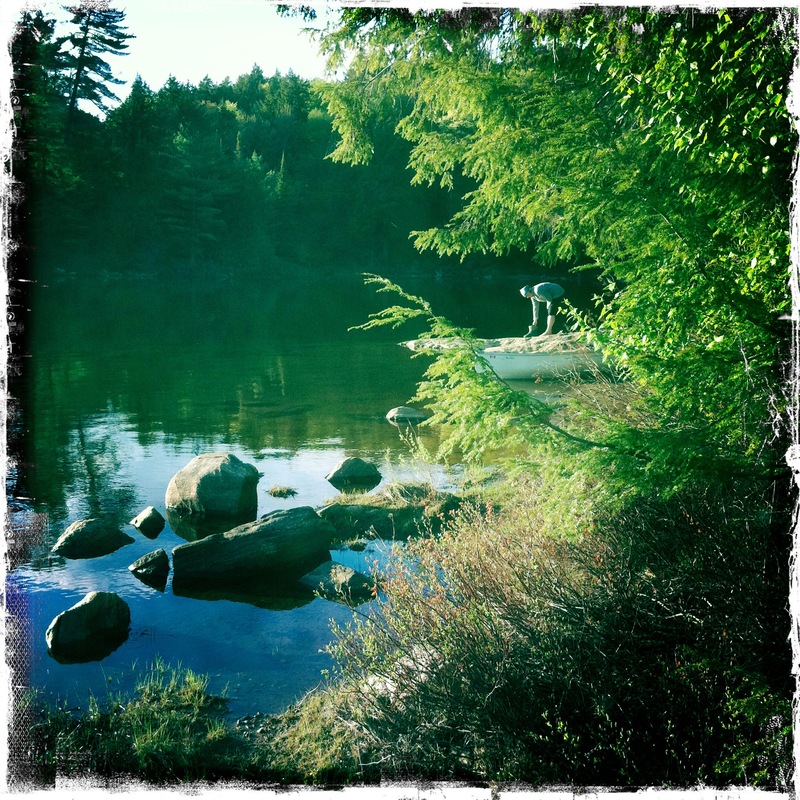 There were a few motor boats out on Smoke Lake taking advantage of the super calm water and sunshine. We saw Molly Island and went through the narrow and enjoyed the views. The Dot and Dash islands are worth noting as you head out or come back in. 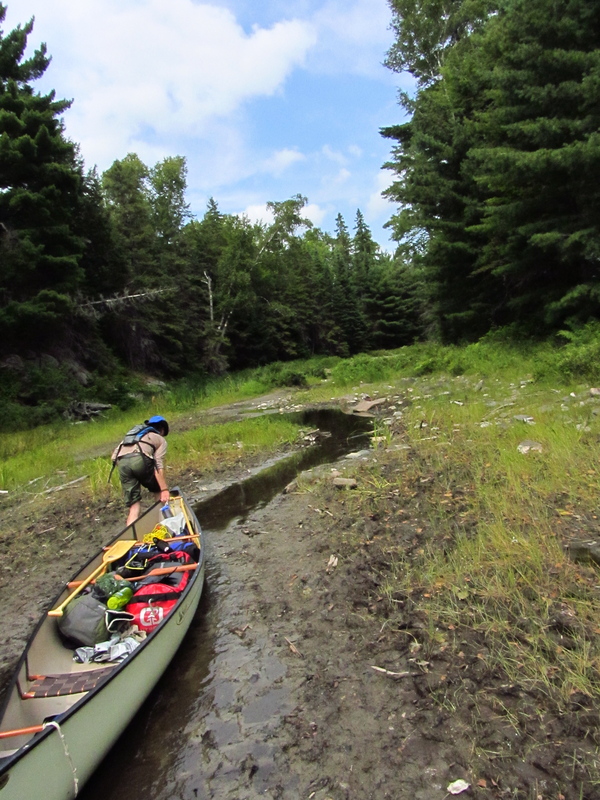 That last 300m portage back to the Portage Store is a real… can’t wait for the next trip! 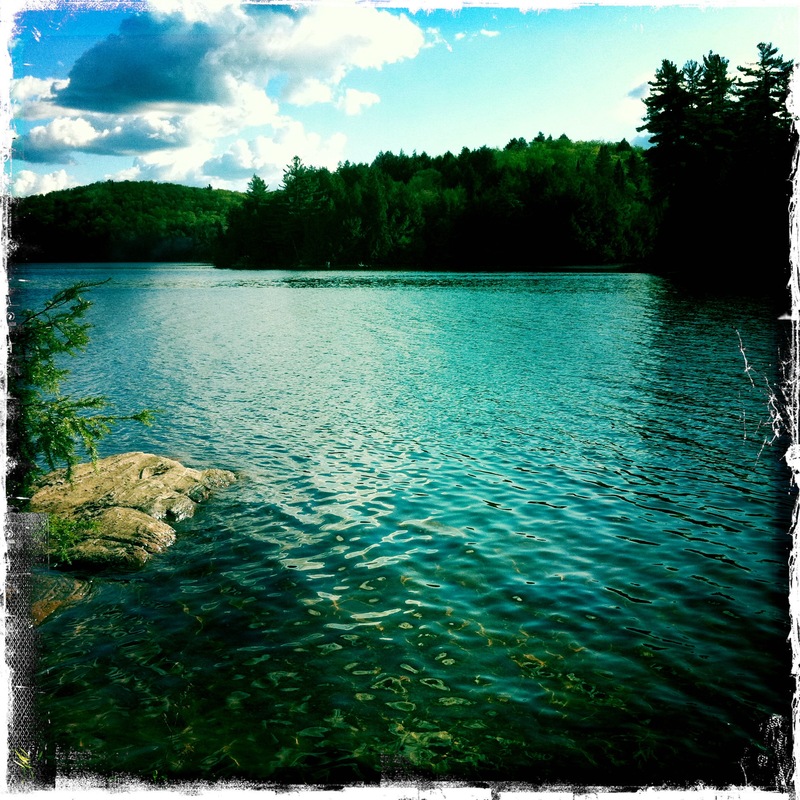 Wildlife seen: Loons, fish. Heard lots. Maybe even a wolf?